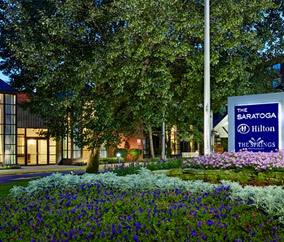 Located just minutes from the famous Saratoga Race Course, The Saratoga Hilton offers inviting accomodations, premium amenities, and top-of-the-line facilities in the heart of the quaint city. In Saratoga Springs, New York, minutes from the Saratoga Race Course, this hotel provides on-site dining along with a number of modern facilities and a 24-hour front desk service. On-site at the Saratoga Hilton, guests can enjoy wireless internet access, state-of-the-art fitness facilities and an indoor swimming pool. Serving American-inspired cuisine, the on-site restaurant, The Springs, provides breakfast, lunch and dinner. The Hilton Saratoga is in the heart of the city, only a short walk from local restaurants, charming shops and a vibrant nightlife. Saratoga State Park is also easily accessible.